A disturbed man who believes Satan speaks in his mind stalks a family who moves into the haunted home where he used to live. In his family’s rural Texas home, troubled Ray Smilie loudly plays his Flying V guitar to drown out the voice of Satan in his head. When his mother Pamela interrupts with the threat of institutionalizing him again, Ray pushes her down the stairs. Ray’s father Walter dies a short time later. Struggling artist Jesse Hellman moves into Ray’s former home with his wife Astrid and teenage daughter Zooey. Jesse soon begins hearing the demonic voice in his head and is compelled to paint disturbing images while entranced in his adjacent studio. Ray moves into a motel room at Shelter Inn and Suites. Deputy Hernandez has a brief encounter with Ray when he is called to investigate complaints of loud music from Ray’s room. Zooey answers the door when Ray comes to the house. Ray notices the guitar tattoo on Zooey’s arm and mentions his Flying V. Zooey excitedly talks about her interest in Ray’s guitar as Jesse interrupts. Disturbed by Ray’s unsettling behavior and insistence on moving back into the house, Jesse dismisses him and threatens to call the police when Ray refuses to leave. Ray eventually returns to his motel where he watches Father David Gideon preach on television. The next day, Zooey finds Ray’s Flying V guitar and a Marshall amplifier sitting outside the house, although Jesse tells Zooey she cannot keep them. Citing that he has a new muse, Jesse goes to see art dealer Leonard’s assistant Mara and asks for Leonard to give his new work another look. Jesse is driven to paint the face of a screaming child over a butterfly on a canvas commissioned by a bank. At the same time, Ray kidnaps Tyler Rosen from an outdoor swing while Tyler’s older brother Logan is distracted. Jesse becomes so engrossed in his work that he forgets to pick up Zooey from school. To make it up to her, Jesse allows Zooey to keep Ray’s guitar and he promises to never be late picking her up again. Ray brings Tyler back to his motel and murders the boy. Meanwhile, Jesse paints more disturbing faces. Astrid is horrified to see that Jesse’s altered painting includes an image of Zooey on fire, although Jesse does not remember painting it. Ray puts Tyler’s dismembered body parts in a suitcase and buries them by the house. Jesse tries to destroy his painting, but finds he is unable to do so. He continues painting instead. Ray sneaks into the house and climbs into bed with Zooey. While Zooey sleeps, Ray tells her that the voice wanted him to kill her, but he refused because she is special. Zooey wakes and screams when she sees Ray. Astrid runs into the room. Ray fights his way past Astrid in Zooey’s bedroom and then past Jesse at the front door to escape. Deputy Winnie comes to the house to take statements following the encounter. Now interested in Jesse’s artwork, Leonard visits the studio. Already late because of Leonard’s visit, Jesse races to pick up Zooey at school, but becomes stranded when a tire blows out. By the time Jesse arrives, he discovers Zooey was abducted by Ray. Ray prepares to dismember Zooey in his motel room. However, Zooey frees herself from her duct tape restraints and escapes through the bathroom window. The family reunites at the sheriff’s station. Sgt. Investigator Davis reveals to Jesse that Ray, whose current whereabouts are now unknown, was in a psychiatric facility for 20 years for abducting a child. Ray explained that he did it because he was feeding Satan, and children are the Devil’s candy. Deputies Winnie and Hernandez wait outside the house while Astrid and Zooey collect belongings to move somewhere else for the night. Jesse destroys the painting in his studio. Ray suddenly crashes his car into the two deputies outside and kills them. Brandishing one of the deputy’s guns, Ray breaks inside and shoots Jesse, who falls to the floor unconscious. Ray shoots Astrid and then tries executing her point blank, but is out of bullets. With Zooey under one arm, Ray sets fire to the house and takes Zooey upstairs to the bedroom. Jesse recovers and gets Astrid outside. Jesse scales the outside wall to break into Zooey’s room, which is now engulfed in flames. Jesse beats Ray to death with the guitar, rescues Zooey, and escapes back outside. Jesse thinks back on all of the children’s faces he painted. Jesse is drawn to a patch of dirt nearby where he begins digging with his hands and uncovers buried suitcases. Jesse looks up to the sky as light washes over his face. Metalhead Jesse Hellman isn’t a starving artist, but he is close to it. That’s why the cheap deal on a remote Texas farmhouse is too good of a bargain to pass up for relocating with his wife Astrid and teenage daughter Zooey. It’s a cheap deal because two people recently died there, though Jesse figures he’ll leave well enough alone and not dig too deep into those deaths. The cause of those deaths is about to dig into Jesse and his family, however. Not-so-gentle giant Ray Smilie usually plays his Flying V guitar at top volume to drown out the sound of Satan speaking in his head. Yet when he hears the voice, he is compelled to come back to the house where his parents died in search of more candy to feed the Devil. Jesse has an unusual connection to Ray, because he hears the voice too. Except for him, the sounds put Jesse in a catatonic trance driving him to paint the tormented faces of children, including his own daughter Zooey. Something sinister is certainly stirring in both men’s minds. And the collision course they are on doesn’t just run through the house. Sitting in its center is Jesse’s family, who is in for a terrifying experience of their own. “The Devil’s Candy” is smart about flipping scripts for stereotypes. Jesse’s atypical relationship with his punky daughter is devoid of the usual angst versus authority tug-of-war, putting the loving father-daughter duo almost instantly in the viewer’s pocket through the sentimentality of a car karaoke connection. That sweetness grounds their family in a tangible reality where intangible darkness is thus permitted to come across as deeply unsettling. Stepping up as the film’s MVP is Pruitt Taylor Vince as Ray. Ray is not the usual Gibson guitar gunslinger one might expect. Vince is no stranger to roles skewing toward a certain side of the spectrum. Yet his lumbering psychopath here is his most layered, evoking shades of Lennie Small sympathy in quieter moments and unfettered fear when his inner brute is uncaged. Development of these dynamics kicks up initial investment in the personalities that plot progression puts on pause midway through the movie. Once tones of tingling terror are traded for acceleration toward amplified action, “The Devil’s Candy” ends up holding a handful of threads with no needle to tighten them. Try finding a single adjective fitting for Shiri Appleby’s character, or a way to describe her that doesn’t include the words ‘wife’ or ‘mother.’ And if there is an essential thematic value that comes from Leland Orser’s brief, yet title card-credited cameo as a televangelist, the movie doesn’t make its meaning obvious. Ditto for Jesse’s ongoing courtship of a Mr. Scratch-like art dealer whose inclusion appears no more useful than as a tool to explain why Jesse is late picking up Zooey from school. Scattershot subplots somewhat wash away in the light of an explosive ending featuring a spectacularly horrifying home invasion scenario. Raw power in depicted brutality delivers stark scares demanding full attention and elevated awareness. These frights are felt in the film’s final effect, accentuated by a palpable pall of demonic dread. Concurrently, there is a nagging notion that the fiction’s foundation is only partially-formed and ultimately underwhelming, hammered home by some suspect digital fire and final moments that aren’t as convincing as the film needs them to be. From a big picture perspective, “The Devil’s Candy” reaffirms the genre filmmaking skills director Sean Byrne debuted in his lauded 2009 movie “The Loved Ones.” Byrne’s sophomore feature compiles a smattering of standard horror film concepts, e.g. haunted house, demonic possession, serial killer thriller, and whips them up in a cerebrally creepy presentation whose atmospheric sum is more compelling than its pedestrian parts. That’s what accomplished cinematic craftsmanship can do for a skeletal script requiring the flesh of fresh skin to seem sleek. In the more immediate moment, what Byrne does not do is fulfill his film’s early promise of being a music-fueled nightmare of unrelentingly satanic proportions. 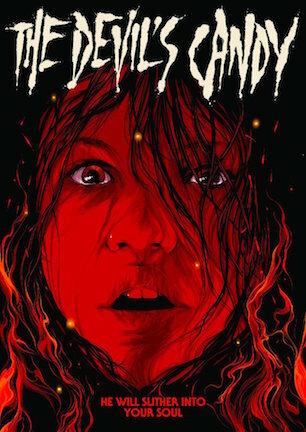 The energy of “The Devil’s Candy” is more semi-hard rock than heavy metal, powered by a pace that would make Ti West proud and a sleepily hypnotic aesthetic reminiscent of “The Witch” (review here) in a contemporary setting. This smoldering style works well for stoking slow-burn suspense, though lingering substance is another story. March 29, 2017 by Ian Sedensky.